The designers at Events By Show Stoppers have our favorite flowers like everyone does. Today’s fleur du jour is the exotic Glorioso Lily. We love the wavy-edged, swept back petals and the magenta-like color. and how it bleeds from fuchsia to red. The petals are reflexed back into a backward arch as if blown by a strong wind. From a design standpoint, we particularly love how the Glorioso Lily can be made to hover above our designer wedding bouquets, contrasting with the colors and textures below due to it’s airy structure. It is a great flower to get lots of depth and texture into a design. It’s easy to see why some people refer to them as “flaming lilies.” Blooming in mid-summer, these strange and exotic looking lily-like flowers are 4 to 5 inches across. 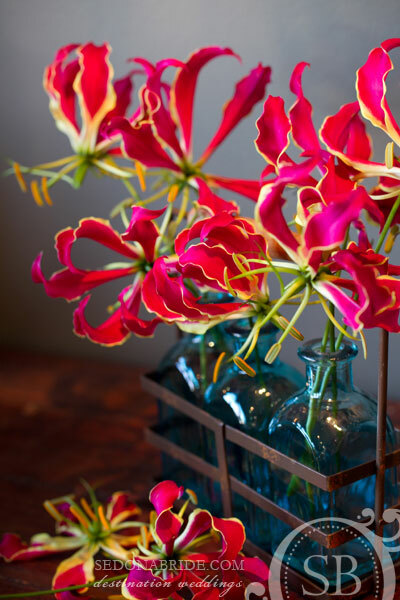 Gloriosa Lilies makes an outstanding addition to cut flower arrangements. The configuration of its stamens and pistil resemble a clock and a minute hand. They have very sturdy, thin stems making them perfect to use alone in small bud vases or colorful bottles. They are extremely long lasting.